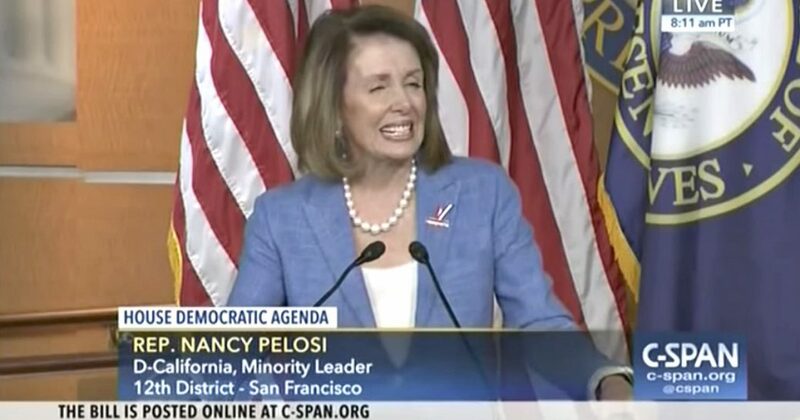 Pelosi wants SOTU address canceled or presented via letter form to Congress!! Does she really think we are so dumb not to realize her ulterior motive? In a previous time during the debate over OBAMACARE, she told her subordinates to ” … just vote for the bill and read it later … ”! And, of course, that is exactly what many did. You see, many Liberal Democrats are good little boys and girls. Especially Senator Charles Schumer, of New York. They listen to “Mommy”. Did you not notice how he was so intimidated in the recent meeting between Pres. Trump, Speaker Pelosi, and himself? He almost appeared cowardly in his demeanor. It was probably in part toward the President, but I would bet he was mostly intimidated by “Mommy Nancy”. In my opinion, most Liberals are “blind followers”. They hear one phrase and assume it depicts the entire subject matter. One word will pique their interest and send them off like a herd of cattle heading for feed. It seems to me that basically, the ‘boys’ in this generation are so insecure and so mindless, that they will follow any woman who is authoritative and Mother-like. Although I certainly do not find A.O.C., by any standards, “Mother-like”. Consider the many who have relocated back to Mommy’s basement. But what do I know? I was raised in the best of times (40’s and 50’s). Long before the drug infested 60’s and the questionable 70’s. Have any of them actually read any of our History? Or perhaps the Constitution and it’s amendments, the Bill of Rights, Thomas Jefferson writings, John Hancock writings, George Washington and Abraham Lincoln writings? ; To name just a very few of our “movers and shakers” of this great Republic we call home. And therein my friends, maybe the core of our problem today. The Liberal University folks have neglected to teach the true History of our Republic. They seem to have concentrated on Political Correctness, unbridled tolerance, and the misguided notion that our Government is responsible for our health, our happiness, our safety, security, and oh yes, let us not forget they want those who have worked hard and diligently to achieve success, to share their hard earned money with the lazy among us, and the less fortunate. Instead of learning how to help others, they preach about sharing everything that the entire community has earned. Now, I am absolutely not in favor of neglecting the less fortunate. On the contrary, I have lived a life of helping and sharing. I firmly believe in helping those that have fallen in their quest for a good life. But I will not give a penny to the lazy, good-for-nothing elements that wander our streets with their hand out; or those who believe in “taking” what they can get, either through violence, scams, or any other form of trickery. Why do you suppose we have folks by the thousands that want to live in America. Too bad these people are only approached by those who would take over our Government, and promise them the World. This Immigration situation must be solved. Our Representatives must be acutely reminded that they work for the people, not the Lobbyists. Maybe we should shut down the Congress, without pay, and see how they feel when their dividends begin to dry up, and the “good life” starts to dwindle out of control. Insist they stop making decisions for us just because they do not like the man we put in office. Or are they truly afraid of the swamp being drained? Where would they live???? Why is there Opposition to the Border Wall?Is Trump Winning?